KATHMANDU (6 December 2018) – Panda Book Corner, a library initiative by the government of China, has been established in five different schools in the Kathmandu valley from Thursday. 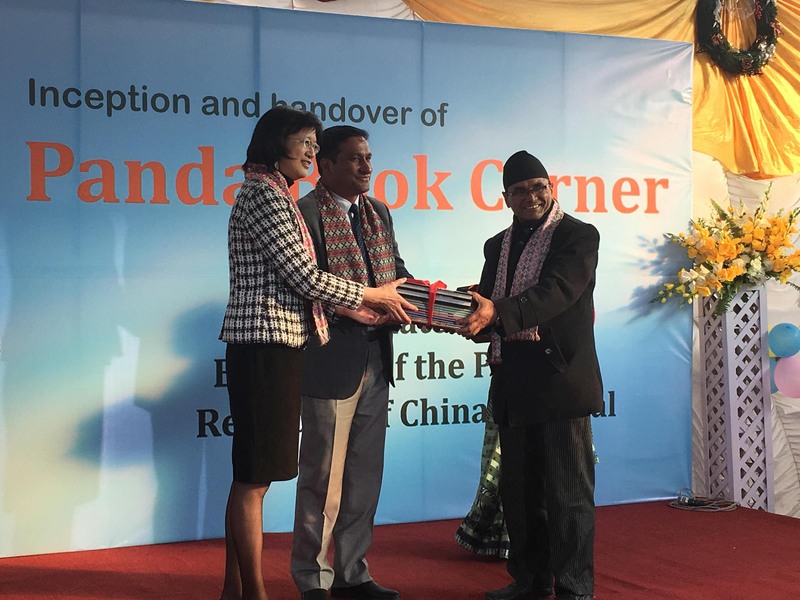 Panda Book Corner is the name given for the library project initiated by Chinese government in Nepal aiming to provide different types of books from China and beyond. As per the initiative, libraries have been established in two community and three private schools in the Kathmandu valley. It is said that there shall be around 5,000 books on Chinese language, Chinese literature, Chinese philosophy, Chinese arts and crafts and so many other genres. At the Inception and Handover of Panda Book Corner in the capital on Thursday, Minister for Forests and Environment Shakti Basnet said that the Panda Book Corner not only supports the children’s learning capacity by widening the horizon of their knowledge but also promotes the bilateral relations with our northern neighbour. “This would be imperative to develop people to people relations and would contribute to increase the dimensions of bilateral relations,” Minister Basnet shared. Minister Basnet believed that establishment of Panda Book Corner would be useful to know about the situation in China, its rapid economic progress and achievements in diverse field. “The books would be equally informative to understand the miraculous development achieved by China in a very short span of time and to translate those ideas into our context,” he argued. On the occasion, Ambassador of China to Nepal Yu Hong said that such literary programmes have helped further deepen age old Nepal-China relations. “The libraries would contribute to making a better personality of the students. And, your contribution would be crucial to enhance Nepal-China relations. You are the true ambassadors of the two countries,” Ambassador Yu said. The programme was organized at the auspices of Nepal-China Friendship Forum (NCFF). On the occasion, President of NCFF Dr Kalyan Raj Sharma said, “Through this, we aim to further deepen Nepal-China relations and promote Chinese language, its history and culture to the students of all levels.” Saying that this marks the historic day in regard to cultural and academic exchange between Nepal and China, Dr Sharma added that this event is also expected to enhance Nepal-China relations at the people to people level. In the preliminary phase, Durbar High School, Bageshwori Higher Secondary School, Pathshala Nepal Foundation, Akshara School and Euro School Nepal were provided with the books under this initiative. Around 3,000 students from these schools would directly benefit by getting information and knowledge about China and Chinese cultures, science, literature, history and other issues from the Panda Book Corner, it is said.